Brute force and maltreatment of the media is the current political culture said Kurunegala District MP Mahinda Rajapaksa in a sly reference to the recent antics of Deputy Minister of Social Welfare and Empowerment Ranjan Ramanayake. Last week Ramanayake was caught on camera responding furiously to a question fired by a reporter and was filmed brushing aside a camera away in a rage. "You, the media, tend to ask all sort of questions from me; however, I don't yell, destroy cameras or twist fingers of the reporters and the cameramen. The real face of this government is finally being exposed. The public have been hoodwinked. The economy has collapsed. We are eagerly waiting to see how the budget turns out." He further noted that the Ratnapura rally will be very successful. Commenting on the cooperatives polls held recently, Rajapaksa noted that the government was losing momentum as it lost the support of the cooperatives. "The general trend is that when a government changes, the cooperatives lean towards the incumbent government, in this case it is the opposite. 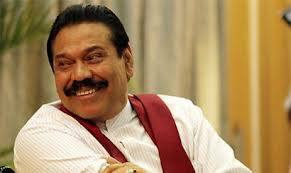 When asked about a recent reconstruction of a provincial government building in Dambulla, which was started during Rajapaksa's tenure but did not contain his name in the plaque, Rajapaksa responded that the government seeks to erase his name from its history and added that his name is etched in the hearts of the people.